I bumped into the new CarrboroCitizen’s Taylor Sisk and Kirk Ross this morning at Carrboro’s Weaver St. Market. “Where’s the paper?”, I asked. Kirk said that more than 20 folks had already called him asking the same question “Where’s my paper?” Well, they had a few bumps on the road to their premier issue. All’s well, though, as the first content ladened and ad packed edition hit the bricks. 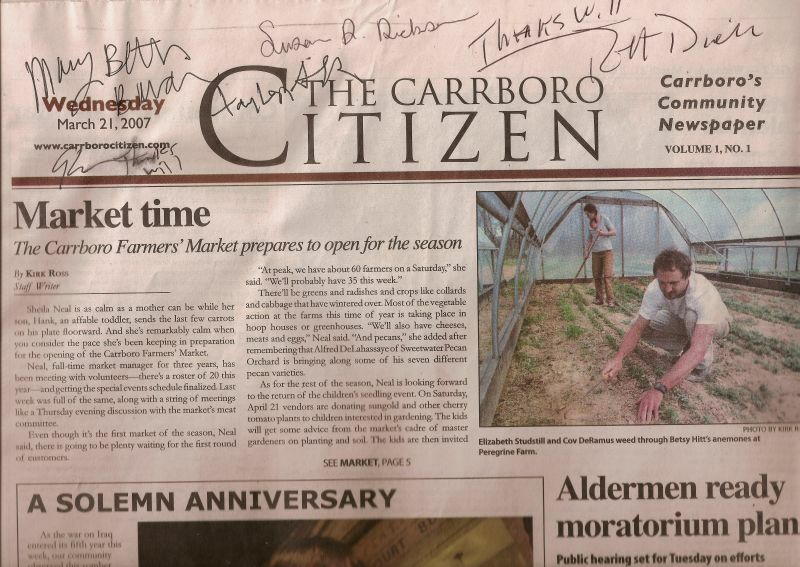 By 3:28pm the papers started appearing around Carrboro – at “the Weave” (inside by the cash registers), at the Orange County Social Club, hand-delivered by Mary Beth to her customers, tossed in the drive of the first 18 home subscribers (all signing up early by “word of mouth”). I like the CarrboroCitizen’s home delivery model – “don’t ask, don’t get”. The first few times I called Ted Vaden, who ran the Chapel Hill News, was to complain about the 3 or 4 copies of each edition showing up in our drive. We lived on the corner of Wyrick and Barclay, sharing a house with another apartment. For some reason the U-shaped drive attracted multiple deliveries – one of which was sufficient (my neighbors usually pitched the paper directly into the recycling bin or, rarely, used it to scrape up the dog poop along Barclay). I thought about that when I was writing the “My View” column for the Chapel Hill News: just how many of my columns went straight to scraping poop up off the roadway? What a year for Kirk Ross, the editor of the CarrboroCitizen. I’d run into Kirk a few times over his many years in Town, and though he is a friend of my brother Steve, never really talked with him at length. That changed last year when we both camped out at my brother’s house during SxSWi 2006. Over the week we talked about new media, citizen journalism, citizen activism, developing a brand as a journalist, leveraging the wisdom and interests of the community to better our community, newspapers – living, dying, lost and in-limbo, music, Austin’s “scene”, BBQ Texas-style, politics (lots and lots of politics – local, state and national) and, along with ae [arsepoetica] and her boy-toy db, the incredible Las Manitas. Coincidentally, it was that same week that CitizenWill really got started. I think he was casting about for a new direction, a new vibe. I had a few conversations with him since about his developing “brand”. Over the last year he’s traveled the State reporting back via the Cape Fear Mercury, kept his finger on the fibrillating pulse of our somewhat nutty North Carolina legislature via his Exile On Jones Street ‘blog, continued to publish at his former gig – the Indy – and, now, not only help create a new Carrboro newspaper from scratch but inverted current conventional wisdom – using the paper’s ‘net content to deliver a physical product. Wow! A bold experiment worth the support of the Carrboro community. Congratulations and good luck guys, the news keeps on rolling and you only have 147 hours, 21 minutes until the next edition is due. Dude. You and your brother both rock steady. Good luck to the Raymond family next week. Thanks for the props and giving folks some insights to all this. I’m going to go burn some of those 147 hours catching up on some sleep.